Best Au Gratin Scalloped Potatoes – and they’re gluten free too! 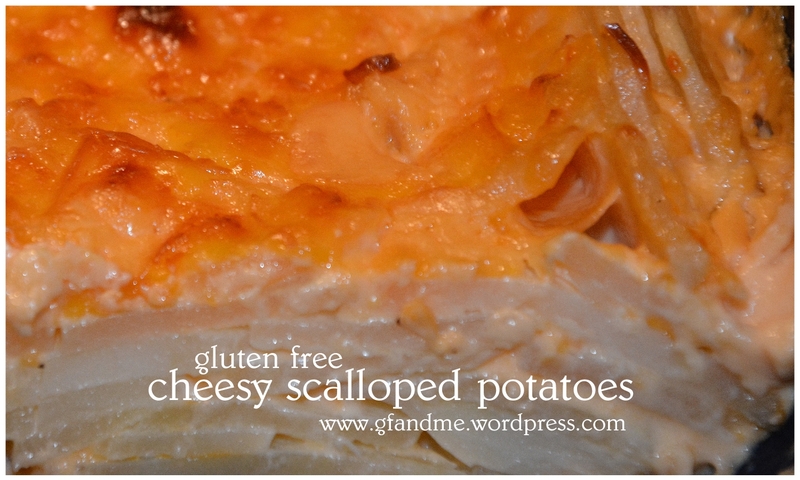 These gluten free scalloped potatoes are cheesy and creamy and made completely without flour. They make a great side dish with ham and reheat wonderfully in the microwave, oven, or on the stove top. Looking for gluten free recipes? Try our Alphabetical Index with everything from apple cake to waffles! In large bowl, mix cream cheese, sour cream, and broth until blended. Add garlic, onion, salt, pepper, and 2 cups of the grated cheddar. Set aside. Rinse and drain sliced potatoes and put in large microwaveable bowl. Cover and microwave on high for 5 minutes, stirring half way through. Pour potatoes into cheese sauce and toss to cover. Pour potatoes into pan. Sprinkle with remaining cup of cheddar and ¼ cup of Parmesan. The Parmesan makes a nice crunchy top but if you want more crunch mix the Parmesan with 1/2 cup GF breadcrumbs and 2 tablespoons melted butter. Bake uncovered for 1 hour. Then increase temperature to 450 degrees and bake for a further 30 minutes or until potatoes are tender. Let sit for 5 to 10 minutes before serving. Goes great with our Holiday Honey Mustard Ham– also gluten free. This entry was posted in Lunch and Dinner, Recipes and tagged casserole, flourless, gluten free, holidays, Kitchen Aid Food Processor. Bookmark the permalink. One of my favorite and most-missed dishes! Thank you for the recipe! No, it’s not low fat. I wouldn’t recommend eating it daily 🙂 But hey, everyone deserves a treat now and then. And you could use low fat cheeses to cut down the fat content. No worries! I don’t do low fat cheeses – the whole point of cheese is FAT! 😀 Nom nom nom! Oh, wow. Your picture of this dish is mouthwatering. It’s the colour and the glistening (of the fat) which, you’re right, isn’t everyday fare but should be made every so often to remind us how good it really is …. Well-done. Thanks! Those potatoes were difficult to get a picture of, actually. This sounds so good. For Thanksgiving if I can’t come up with a gluten-free dressing I can stand I might have to do scalloped potatoes for me. Good luck with the dressing, but the potatoes are really great! Thank you for the compliments and I hope you enjoy our website! Made these ahead of time for Christmas Eve. They smell wonderful. Always grateful for a delicious gluten free recipe that everyone will love.